A number of dogs love to carry a stick, catch a stick and chew a stick. 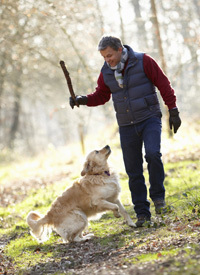 Some will actively find their own stick when exercising off the lead on a walk! The majority of the time, this is harmless fun but sometimes part of a stick can go further than planned! Stick injuries in dogs can be serious. How can a stick harm my dog? Occasionally, a section of twig can get lodged across the hard palate (this is the roof of the mouth), between the upper molar teeth. This will cause distress, with the dogs pawing at their mouths. 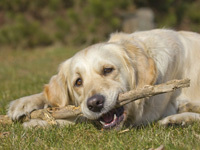 If a dog has run at speed to catch a stick and in effect ‘run onto a stick’, then there is potential for sections of stick or twig to penetrate deeper into the mouth, neck or throat. Dogs will yelp out on the impact with the stick, gag and clear their throat and become quiet and subdued. Should I get my dog checked over after a stick injury? It is important to get your pet checked over by your vet the same day that the suspected stick injury happens. Your vet will carefully examine around your dog’s neck and perform a thorough clinical examination of the heart and lungs before contemplating sedation. Sedation or general anaesthesia are likely to be performed to check the oral cavity and throat for signs of injury, bruising or splinter remnants. If there appears to be a small tear in the throat region, then this isn’t usually repaired and instead is left open to heal by ‘secondary intention’ (ie to heal from the inside out). Pain relief prescribed by a vet is a must for all patients that have experienced a stick trauma. Antibiotics may not be necessary. If a section of twig is lodged across the hard palate, this is simply removed. Where there is a strong suspicion that your dog has run onto a stick, and they are depressed and in a lot of discomfort, then your vet may take x-rays of your dog’s neck and chest. An x-ray rarely shows up the section of stick, but may give away some ‘tell tell’ signs of penetration with abnormal air pockets tracking down between the muscles. Endoscopy, using fibre-optic cameras, is a useful tool to rule out any stick sections or twigs that may have gone into or torn the oesophagus (the tube connecting the throat to the stomach) or trachea (the windpipe). Inspecting the oral cavity, throat or oesophagus a number of days after the initial stick trauma will often not reveal any signs of injury. The tissues in those regions heals quickly, concealing any splinters beneath them. Does my pet need advanced imaging after a suspected stick injury? Advanced imaging – ie CT or MRI scans – can be extremely useful to rule in or out the presence of penetrating foreign bodies such as sections of twig or wood. Quite often, no segments of wood are identified but at least you and your vet can have the peace of mind that your dog does not require exploratory surgery. 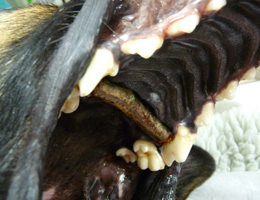 Why do some dogs develop a large abscess under their chin? Weeks or months after the initial stick injury, some dogs start to develop a swelling under their chin. The swelling is often not painful but the dogs can become lethargic and off their food if an abscess is brewing. Nature may take its course and the abscess may burst out onto the skin. Antibiotics and anti-inflammatories may help at this stage, however, some abscesses, do require surgical attention. Your vet may want to explore the abscess, and this can occasionally reveal a remaining splinter. Where no section of wood is found, the exploration still serves to flush the site with sterile saline and remove some of the dead tissue in the abscess cavity. A surgical drain is then usually placed to allow further drainage of fluid for a few days. Throwing a stick for your dog is not a good idea! Abscesses can reform again, even after surgical intervention, but usually with time alone these events become less frequent and eventually stop occurring. Advanced imaging (CT and MRI) is always helpful in order to plan the surgical exploration of an abscess that may contain foreign material. This reduces the surgical time if your vet knows in advance that there is no obvious splinter section to locate and remove, just the abscess to flush out. However, advanced imaging carries an extra expense that may not be within every pet owner’s financial means, in which case a simple small surgical approach to flush the abscess cavity through and place a surgical drain may still prove highly beneficial. 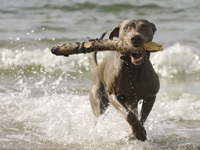 Playing with sticks can end in tears for some of our playful canine friends. A tactic to try and avoid your pets chasing and carrying sticks is to provide other toys for them to play with whilst on their walks, and definitely as pet owners we should avoid the temptation to actually throw a stick for our dogs!